The Page Editor is a content management system to manage web pages for your website and/or individual products. Web pages are not mandatory to be setup for products but do give you the ability to provide excellent user experience through use of interactive on page content. How to use the Page Editor. An overview of the different widgets that can be used and how to set them up. 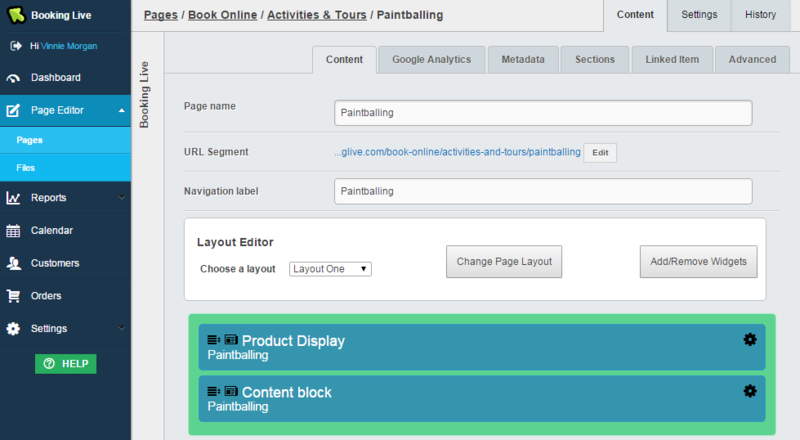 The default Booking Live page - Allowing dynamic templates and use of the systems widgets. Comes with a drag/drop editor. A basic page, allowing standard HTML content, and no custom templates. Useful for simple pages, that are mainly text and not frequently updated. A page type, that allows you to create a custom form to embed into the page. Very useful for contact forms etc. Special page type, that will act as an iFrame to another website. This is great for making an entire page served from an external source. Special page type, for creating redirects internally, or creating specific pages that redirect users to external sources.